Here’s a project I made last year for my 24 Crafts in 24 Hours blog celebration. I thought you might like to see it again…it’s so pretty and super easy to make! 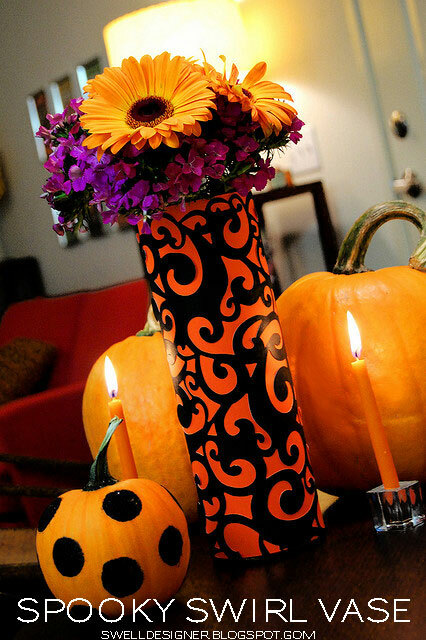 Make a sophisticated and spooky vase on the cheap! It will be the perfect accent for your Halloween dinner table. Here’s how I did it! 1. Spray the back of your diecut cardstock and place on top of orange cardstock. 2. Measure the height of your cylinder vase. Cut paper to that height using paper cutter. 3. Wrap around cylinder vase and secure in place with double-sided tape. Fill with your favorite floral arrangement. I chose flowers in fuchsias and orange; however you may want to use faux flowers or black roses. Check back next hour for another spooktastic Halloween idea! 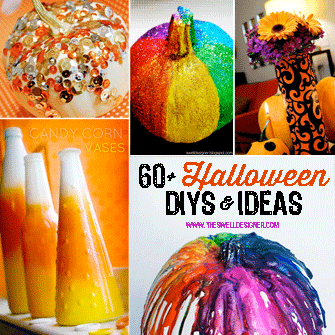 Over 35 Swell Halloween Projects Compiled! Over the past few years, I’ve created a lot of crafts, especially Halloween crafts! There’s something about Halloween and the fact that it’s a bit funky/silly/spooky and subversive that I connect with. I love that it is a time that people get to express themselves in a different way and just have fun! I wanted to compile all these projects for you to enjoy over the Halloween season. I know I’m already starting to think about my Halloween craft projects and I’m betting you are too, so enjoy these ideas and check back to my blog for more inspiration and ideas in the next couple of months leading up to Halloween! My 24 Halloween Crafts in 24 Hours Compiled! Well, I’m gonna pimp these 24 Halloween Crafts in 24 Hours for all they are worth, so I’m sharing them again…this time in compiled version for anyone who might have missed some 🙂 Enjoy! 1. Measure the square on the front of the notebook and cut a piece of scrapbook paper to fit it. Round the corners and apply paper to notebook with Tacky Glue stick. 2. Apply letters to the middle of the scrapbook paper area. 3. Measure, then cut and glue ribbons and buttons to frame scrapbook paper area. Measure and cut ribbon to go lengthwise down the side of the notebook and glue. 4. Decorate around edges of notebook with Scribbles paint. Let dry. 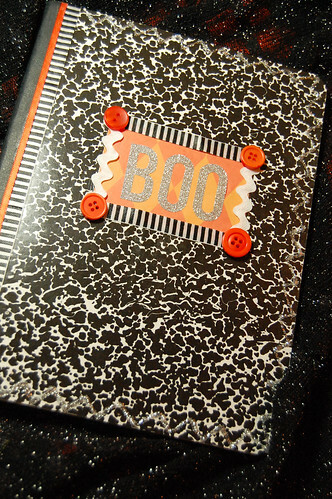 This would make a great little notebook for your Halloween party planning, lists, blog ideas, sketches, etc.! Or perhaps a sweet little gift for a Halloween party. Thanks for stopping by today for my 24 crafts in 24 hours! I will be sharing more Halloween crafts on Terrorific Tuesdays, so look for those posts in the weeks to come! Looking for a fun way to present your veggies, fruit, or dip this Halloween season? Look no further than your local wig shop or Halloween supply store! A few years back, I purchased this Styrofoam head for $5 at my local Halloween Express and it sure has come in handy at Halloween time ever since! All you need is the head form and some toothpicks! Oh, and veggies or fruit of course! 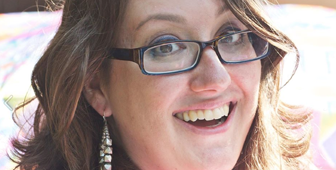 I though about how I wanted to arrange the different veggie shapes on my head and then went to town. I simply stuck them in place with the toothpicks. 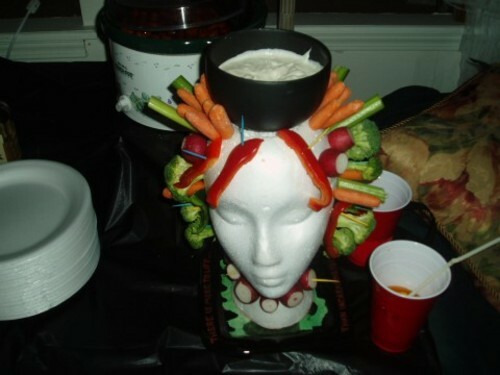 I tried to adorn certain areas like the neck with a radish necklace and the top of the head with red pepper bangs. You could also put radishes for eyes or peppers for funky-looking lips. For mine, I also decided to scoop out part of the top with a knife so that I could insert a bowl full of dip at top. Be careful when working with the knife when scooping! Check back next hour for another spooktastic craft! Just because Polaroids aren’t officially sold anymore, doesn’t mean you can’t still can’t relive their glory days! With the slew of downloadable faux Polaroid templates on the web, you can recreate the classic look of a Polaroid. Here’s how! 1. Download the Polaroid template to your computer and open it up in your photo editing software. 2. Open up your digital or scanned photos. Select blank black area with selector tool and paste photo into that area (for Photoshop users select Edit>Paste into. Enlarge photo as needed. 3. Lay two up on piece of white cardstock and print out. 4. 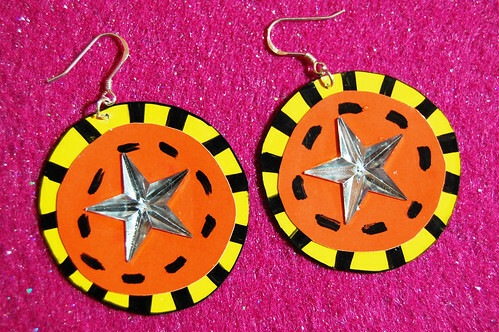 Cut out and adhere to pumpkin with adhesive dots. 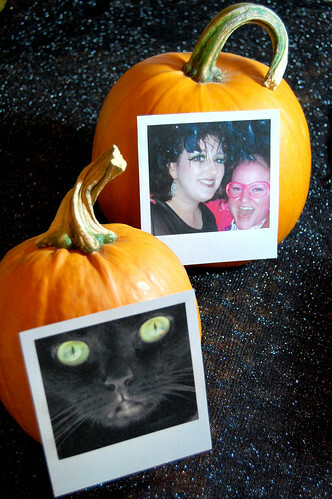 Admittedly, the faux Polaroids look better on a large pumpkin. As you can see, my pumpkins were on the medium/small scale. And of course, if you have actual Polaroid photos, totally go for it! Check back next hour for another spooktastic Halloween project! I have always wanted to make a feather wreath and I wanted something that was going to make me smile as soon as I see my door. It’s light, airy, fun, funky and I think that’s more my approach to Halloween. I heart Glitterville and kinda took a page from that book in creating this. I think there are options out there for crafters to get that high end look, but for a reasonable price (this cost me about $16 bucks to make) rather than paying an arm and a leg for something storebought. It’s worth it…you just have to know what you are looking for and watch out for sales (oh, and 40% off coupons help too). 1. Glue gun end of feather boa to styrofoam wreath. Wrap around half of wreath and glue other end in place. 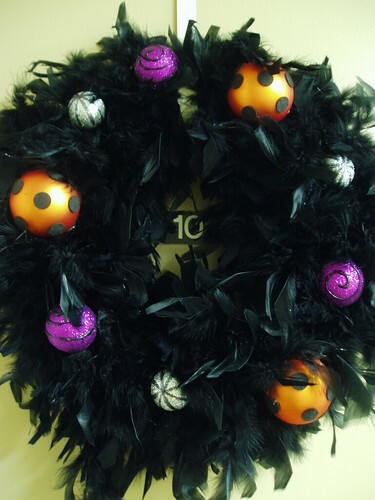 Glue gun and wrap second boa around wreath blank until entire wreath is covered in feathers. 2. Spray paint sheet of padded protectors. Once dry, randomly stick on orange ornaments for “flocked” look. 3. Create large swirls on purple sparkle ornaments with black 3-D paint. Set upright in small container or on an ornament hanger and let dry. 4. Draw stripes on small silver balls with sharpie marker. 5. Once all ornaments are dry, adhere ornaments to styrofoam part of wreath with glue gun. Fluff feathers around each ornament after glue is applied to make styrofoam area unnoticeable. Let dry. Helpful hint: Store wreath in an ornament wreath keeper to prevent loose feathers or damage to ornaments. Since the orange ornaments are glass, they should be handled with care and stored accordingly. – Also use stickers plus a fun phrase for custom party invitations. Mix it up and send everyone a different sticker with a different phrase. – Add a sticker to a little foldover card and write out a guests name for a custom placecard. 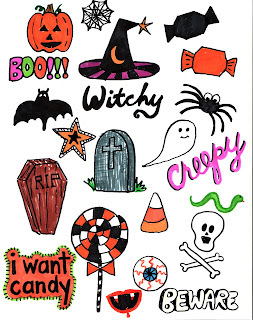 – Scan in stickers or Halloween images and print them out to make magnets, custom iron ons, or labels. – Stickers can be applied to wooden discs for custom charm bracelets, pendants, and rings. Seal with decopauge medium! – Use stickers for cupcake toppers! – Personalize mini pumpkins with letter or phrase stickers. Makes a cute little gift too! Hope these were some inspiring sticker ideas!